The City of Arches picks up a short time after the ending of The Kingdom Thief as Sitnalta explores her regained home and discovers a letter in which her mother proclaims her love for the wizard Kralc. Stunned, Sitnalta begins to read, taking the readers on a journey into the past to learn the true history of Queen Learsi: a princess in hiding, a forbidden love affair with an enigmatic wizard, and the creation of a magical coin. Kralc finds a ragged Learsi living on the streets after her home kingdom’s destruction and presents an offer: help him set things right with the mysterious City of Arches and he will give her back her family and birthright. With her parents murdered and her kingdom in ruins, she doesn’t know how he can achieve such a thing. All she knows is that she has nothing to lose. Sitnalta carefully put the cloak aside and looked into the trunk to see what else there was. She pulled out a pair of brown leather breeches, a green tunic, and a wickedly sharp silver dagger. She frowned as she looked at these items, wondering what they were doing in a room filled with gowns and jewels, then grinned as she saw a stack of parchment held together with wide red ribbons. For her, this was real treasure. Words held real meaning. Words could tell a story, and through the lines on these pages, she would learn whose things these were. She picked up the stack, untied the ribbon, and unfolded the top piece of parchment. Sitnalta realized she was looking at a long letter. It had not been sealed and she furrowed her brow in thought, coming to the conclusion that it had never been sent. Who would write such a long letter and not send it? This made no sense for someone to take the time to commit so much to so many pages and leave it unsaid. She knew that she had to find out what had happened, and why the letter was never sent. Sitnalta’s mind filled with hundreds of questions. She remembered the wizard and his thunderous moods. Her last meeting with him had ended cordially, but it had nearly resulted in disaster for those she cared about. For anyone to address him as “dearest” boggled the mind. She briefly thought that there might be another with that name, but a quick read of the next few lines mentioned the use of magic, and she quickly dismissed that idea. She looked at the next few pages, and saw that they contained the details of a story. Goldenberg's The City of Arches is a charming take on the traditional fantasy offering just enough differences (such as the protagonist's disability) to keep even a jaded reader intrigued. Alisse Lee-Goldenberg's imagination and storytelling is absolutely superb. She had me turning pages well past my bedtime and I don't regret it in the least. Fantastic and fabulous, a story for everyone to fall in love with. This series is awesome and this book might just be my new favorite of the bunch! Goldenberg is an amazing storyteller and even though this is book 3, the characters and story feel fresh, vibrant and original. I made a playlist of songs that I either listened to while writing this book, or that I was inspired by. Go here to have a listen. The City of Arches ​is now available on Kindle and Kindle Unlimited here. 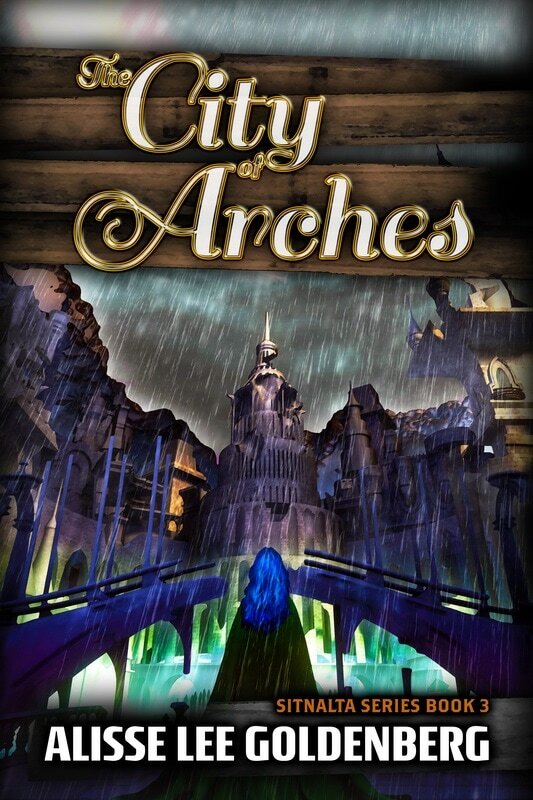 You can purchase The City of Arches ​as a paperback here.